Along with an update on their x86 plans, AMD has also presented an update on their ARM plans at financial analyst day today. The news there is a mixed blessing, depending on one’s point of view. AMD’s “Seattle” SoC – the ARM Cortex-A57 powered Opteron A1100 – will finally be shipping in H2 of this year, after first sampling towards the end of last year. This unfortunately is almost a year behind AMD’s original schedule, though AMD seems moderately optimistic about catching up once they have their first ARM silicon out the door. But the real focus of AMD’s comments on ARM for FAD involve K12, the AMD-developed ARM CPU core being designed alongside Zen. With AMD having opted to prioritize Zen development, K12 has been pushed back from 2016 to 2017, essentially taking the near-simultaneous launch of the two parts off the table. AMD for their part is attributing this change in schedule only to the decision to focus on Zen, however with Opteron A1100 delayed, it’s entirely possible this is also a knock-on effect that has pushed back the entire AMD ARM roadmap. In any case, even with the delay AMD is still eagerly moving ahead with their ARM plans. A1100, even though it’s late, will be the pathfinder for AMD’s ARM efforts, serving as a platform to further develop the AMD ARM ecosystem, getting developers acquainted with the technology and getting software ready for it. 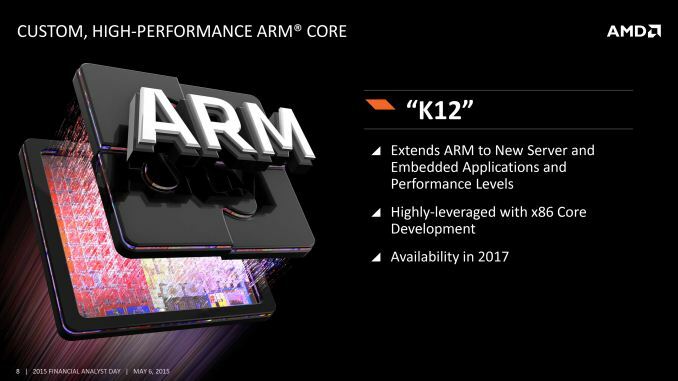 K12 in turn will come in after that ecosystem has already seen some development, allowing AMD to get their new hardware out to the market and already have software support for it. I hesitate to say that this makes A1100 entirely a pathfinder product – until it’s available, it’s not clear how many customers might purchase it for production work – but clearly AMD’s big play is K12, not A1100. And though K12 is delayed, AMD tells us that this hasn’t changed how it’s being developed, which is to say that it’s being done in concert with Zen. So virtually everything AMD gets right with Zen will be integrated into K12 as well, just on the basis of the ARM ISA instead of x86. AMD still believes that the time is right for ARM in the server space – along with a very obvious place in the semi-custom SoC space – and that K12 will be an interesting alternative to Zen in that regard. They can't afford to drop this project in investors eyes. AMD brings legitimacy to ARM on desktop and server. That being said, AMD's plain ARM chip being behind is sad and obviously ties up development efforts. They need to get the first one out the door and poach some Apple employees too. @MartinT AMD has a suite of problems. Seems mostly related to their board following the hype and not making clear engineering and business decisions. They ditched the previous CEO who was doing quite well and had turned AMD around and made them profitable. The board did this because they "must be in smartphones/tablets", even though they couldn't answer the CEOs question about how to make such an attempt profitable. So they ditched their FAB, and now much use FABs that follow the most profitable chips. Sadly that's not ideal for competing with Intel. So now AMDs in a position where they don't match performance or performance per watt. Intel's stopped innovating on performance of their CPUs and GPUs, all have only seen very small improvements. A 3+ GHz quad core sandybridge isn't that different than a 3+ GHz quad core broadwell. Nor has GPU performance increased much from the HD4600. For normal use cases the sandybridge, ivy bridgbe, haswell, and broadwell have only made small incremental improvements in performance (clock rate, ipc, or ipc per clock). Intel has been pushing hard on performance per watt though. So without being able to beat Intel AMD can't charge much for a CPU. FABs are optimized for things like smartphone CPUs which are not designed to compete with Intel's laptop/desktop chips. Intel's performance increases slowing down are due to them only having a really advanced micro-architecture where all the "low and medium hanging fruit" has always been picked. Anything to increase performance from Intel is very expensive and challenging. Lowering power at the same performance now, that has more low/medium hanging fruit (at least, it did, I think Intel has gotten most of it by now) allowing for large improvements. As for drivers and Nvidia/AMD... That's FUD from 4 years ago on the consumer side. The drivers are more or less the same, either slightly favoring Nvidia or even. Actually, AMD APUs have better perf (gpu/games wise) then competing Intels. And Intels recent iGPUs are weak cause of too low heat room. Meaning they would do better (in notebooks where it matter) if only had better cooling. So OEMs choose baseline models. Though if one took Your words as "Intel stagnated a bit in APU space recently, AMD can outdo them in single gen still", then its correct. AMD can still put good chips that would fight with Intel offerings on performance terms. So AMD do have some attack angles. Lets see if something pan out this year!